Koodalmanikyam is the Malayalam translation of the Sanskrit word Sangameswara. There is, however, another folklore about the name. One day the idol was found to give out uncommon brightness from its forehead. Beaing unable to identify the source of the brightness, some brought a Quartz (Manikyam) in the possession of Raja of Kayamkulam for comparison. As they were comparing the brightness of the two, it is said the stone brought from Kayamkulam mysteriously slipped from the hand and merged with the one on the idol. The merging of the two manikyams led to the name 'Koodalmanikyam'. Similar brightness is reported to have appeared on the idol once again, much later in 1907. A straight stretch of 150 meters from Irinjalakuda Municipal Bus Station takes you to the Temple. The eastern gate way (Gopuram) is an impressive structure in the typical Kerala style of architecture with tiled roof and white washed walls. Numerous carvings are embedded into the front wall of the gateway. From the Gopuram you enter the outer quadrangle. The Temple is situated inside a well walled up ten-acre plot with attractive gateways on the East, South and West. The huge porches on the Eastern and Western approach ways to the inner temple can accommodate not less than twenty-one elephants. The Sanctum Sanctorum is round shaped and is covered with copper plates. A six-foot Thaazhikakudam at the pinnacle adds to the beauty and majesty of the total temple complex. On the Southern courtyard is the well-known Koothambalam, the Natyagruha for Koothu and Koodiyattom. 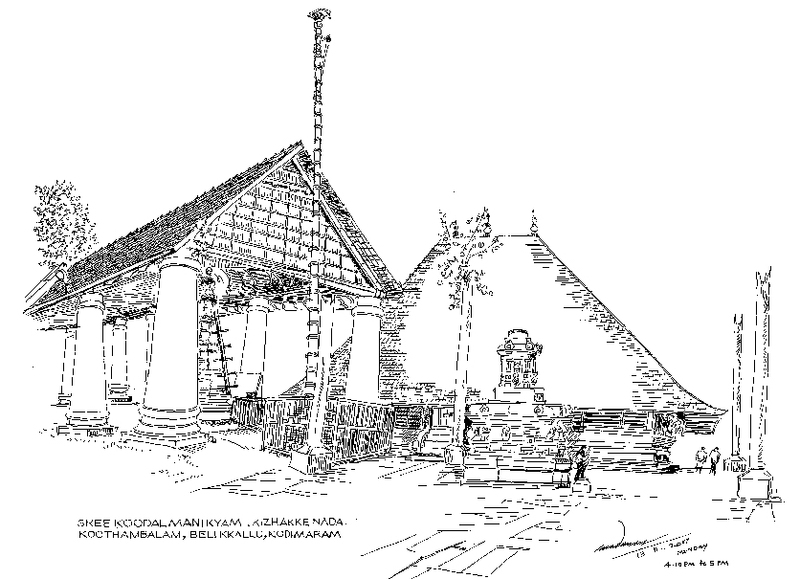 The earliest historical reference to Koodalmanikyam Temple is found in a stone inscription attributed to the Chera king Stanu Ravi Varman dated 854 A.D, donating vast extents of land for the Temple. It is, therefore, reasonable to assume that the Temple must have been in existence for quite some time before this date and that even then Koodalmanickyam was occupying a place of importance among the temples of Kerala. Another Cheraman Perumal Bhaskara Ravi Varma has donated vast lands at Potta near Chalakudy to the Temple. The Temple was in the domain of the erstwhile Maharaja of Cochin; but the administration was under a person designated as Thachudaya Kaimal appointed by the Maharaja of Travancore. In 1971, the Government of Kerala, through a special order, took over the administration of the Temple. A Committee appointed from time to time by the Government of Kerala now manages the Temple. The Chairman of the Committee is the District Collector, Thrissur. The Chief Executive of the Devaswom is the Administrator not below the rank of a Deputy Collector deputed by the Government as the Secretary of the Committee. Koodalmanikyam Temple is a marvel in architectural beauty. The impressive gateways, round shaped Sanctum Sactorum, the majestic Koothambalam and the Carvings in wood and stone on the walls all attract students of Art and Architecture. The murals on the walls on either side of the Eastern entry to Chuttambalam also deserve special mention. The Temple had also been an important centre of nourishment of the Temple Arts like Kathakali, Koothu, Koodiyattom and Thullal. Koothambalam stage had the rare fortune to witness historic stage shows by the masteros of AmmannoorChakyar family. Unnai Warrier, the author of Nalacharitam was a native of Irinjalakuda and an ardent devotee of Sangamewara. He has also composed a Sanskrit poem – Sree Rama Pancha Sathi that is an abridged version of Ramayana in fifty dasakas dedicated to Lord Sangameswara. Koodalmanikyam is the Malayalam translation of the Sanskrit word Sangameswara. There is, however, another folklore about the name.